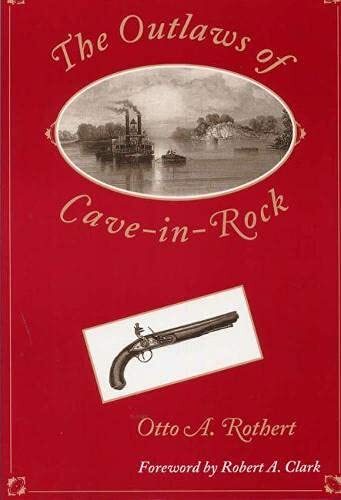 Exceptionally rare and valued by book collectors, Otto A. Rothert s riveting saga of the outlaws and scoundrels of Cave-in-Rock chronicles the adventures of an audacious cast of river pirates and highwaymen who operated in and around the famous Ohio River cavernfrom 1795 through 1820 (adventures featured in Disney s Davy Crockett and the film How the West Was Won). Once sporting the enticing sign "Liquor Vault and House for Entertainment," this beautiful cavern location decoyed the unsuspecting by offering a venue for food, drink, and rest. Compellingly lively, The Outlaws of Cave-in-Rock is nonetheless the work of a scholar, a historian who documents his findings and leaves a detailed bibliographical trail. Presenting many eyewitness accounts, Rothert supplies the lore and legend of the colorful villains of Cave-in-Rock. Always maintaining the difference between stories he tells with historical authority and those that are pure speculation, Rothert provides both a fascinating narrative and a valuable regional history. " "From 1795 through 1820, the rock-ribbed walls of the Cave-in-Rock cavern echoed the drunken hilarity of villains and witnessed the death struggles of many a vanquished man. 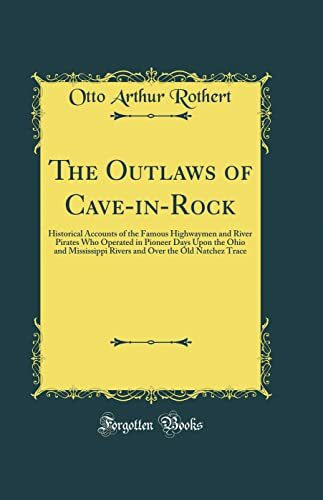 Otto A. Rothert chronicles the adventures of an audacious cast of river pirates and highway-men who operated in and around the famous Cave-in-Rock." --"Metropolis Planet"
From 1795 through 1820, the rock-ribbed walls of the Cave-in-Rock cavern echoed the drunken hilarity of villains and witnessed the death struggles of many a vanquished man. 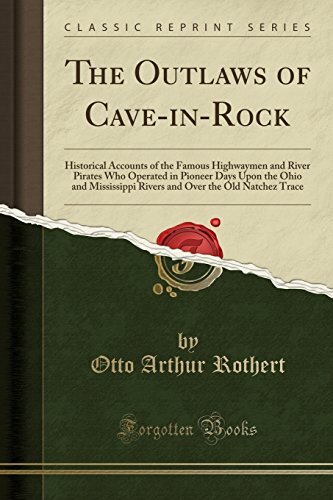 Otto A. Rothert chronicles the adventures of an audacious cast of river pirates and highway-men who operated in and around the famous Cave-in-Rock. "Metropolis Planet""
"This book is intended to give the authentic account of the famous Cave-in-Rock of the lower Ohio River...and to present verified accounts of the most notorious of those highwaymen and river pirates who in the early days of the Middle West and South filled the Mississippi basin with the alarm and terror of their crimes and exploits. 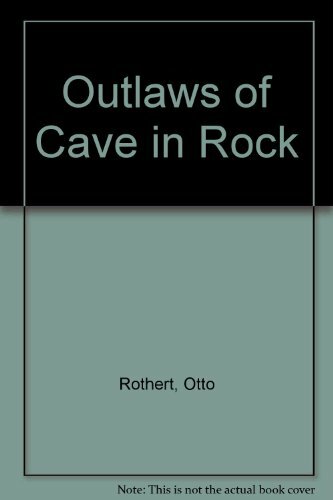 "Otto A. Rothert"
Exceptionally rare and valued by book collectors, Otto A. Rothert's riveting saga of the outlaws and scoundrels of Cave-in-Rock has not been available to the general public for decades. Rothert chronicles the adventures of an audacious cast of river pirates and highwaymen who operated in and around the famous Ohio River cavern from 1795 through 1820 (adventures featured in Disney's Davy Crockett and the film How the West Was Won). Once sporting the enticing sign "Liquor Vault and House for Entertainment", this beautiful cavern location decoyed the unsuspecting by offering a venue for food, drink, and rest. As a "scene for shrouded crime", Rothert notes, "it was perfect". Rothert's predators range from the brutish Harpes and the gentleman-soldier-turned-brigand Samuel Mason to the mysterious James Ford, probably of the murderous Ford's Ferry gang. Where the Harpes were bloodthirsty and barbaric, Mason was shrewd. Mason never shed blood unless to protect himself, and he robbed for booty - not the joy of the kill. The last of the Cave-in-Rock outlaws, the Ford's Ferry gang, left many skeletons, yet their activities remain mysterious. In his foreword to this edition, Robert A. Clark notes that when Rothert queried the Arthur H. Clark Company regarding his manuscript in the spring of 1922, he wrote: "I have an idea it will be interesting to those who 'dearly love the excitements of the criminally audacious.'" Rothert was correct. Compellingly lively, The Outlaws of Cave-in-Rock is nonetheless the work of a scholar, a historian who documents his findings and leaves a detailed bibliographical trail. Presenting many eyewitness accounts, Rothert supplies the lore and legend of the colorfulvillains of Cave-in-Rock. Always maintaining the difference between stories he tells with historical authority and those that are pure speculation, Rothert provides both a fascinating narrative and a valuable regional history.